Many counties have incomplete roadway inventories, but lack asset management programs, which are often cost-prohibitive and require advanced technical training and staff to maintain. 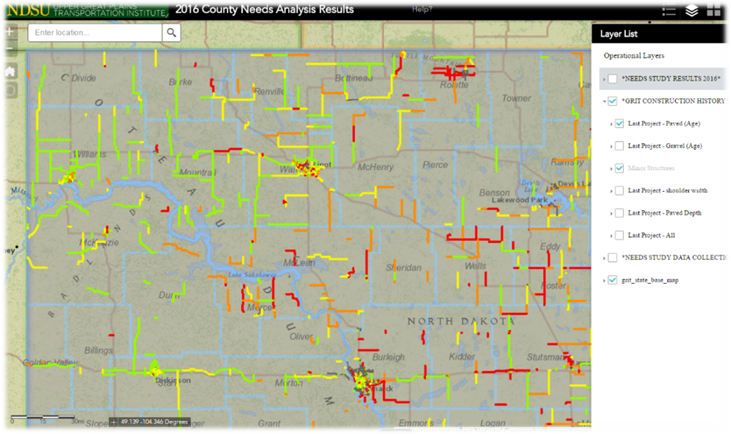 The Upper Great Plains Transportation Institute at North Dakota State University (NDSU), has developed a low-cost asset inventory program called the Geographic Roadway Inventory Tool (GRIT). The program, which is currently available to North Dakota counties, will be offered to all Minnesota counties following further development and testing by the Minnesota Local Road Research Board. NDSU created the asset inventory program as the first step for asset management to allow local roadway managers to document and understand their existing infrastructure using the latest mobile technology and Geographic Information System technology. The goal of the research study is to expand the program to include roadway forecasting based on the American Association of State and Highway Transportation Officials(AASHTO) 93 model with inventory, pavement condition and traffic forecasting data. Existing input data from GRIT, such as pavement thickness, roadway structural information and construction planning information, will be spatially combined with current Pathway pavement condition and traffic data from MnDOT to automatically forecast the future condition and age of roadways using the AASHTO 93 model. This forecasting model will then allow roadway managers to use this information with comprehensive GIS web maps to prioritize roadways in construction schedule or multi-year plans. The additional information contained in the pavement forecast system will allow county roadway managers to prioritize projects that can benefit from lower cost pavement preservation activities and understand how long roadways can last before a high cost reconstruction must take place. The online GIS output maps will also enable the public to see what projects will be conducted on a year-to-year basis. The research team will work with Beltrami, Pope, Faribault, Pennington, and Becker counties and the city of Moorhead in Minnesota to research, develop, test and implement an additional forecasting function of the existing asset management program. This will be done using the AASHTO 93 empirical model to calculate a future pavement serviceability rating (PSR) based on the existing pavement structure and age, forecasted traffic and the latest pavement condition. While existing pavement structure and age information will come from data entered into the GRIT program by counties, processes and procedures will be researched and developed to automatically access pavement condition and traffic data from MnDOT and geospatially combine it with inventory data. With pavement forecast information, county roadway managers will be able to better understand which roadways will deteriorate first and which will benefit from more effective, low-cost maintenance programs rather than full-depth reconstructions. The model will not forecast suggested future projects or project costs, but rather just output the future condition of the roadways on a yearly basis. The AASHTO model can be applied for both flexible and rigid pavement sections. Watch for new developments on this project. Other Minnesota research can be found at MnDOT.gov/research.